Make an elegant and warm statement in your master bathroom with the classic styling of the Pegasus Estates Vanity in Rich Mahogany with Granite Vanity Top in Black. Beautifully detailed with hand-crafted scroll work and fluted pilasters, this vanity has a rich mahogany finish and provides ample storage with two spacious side cabinets and three centre drawers. The included black granite vanity top comes with two unattached vitreous china basins and a backsplash and is also pre-drilled for two 8-inch widespread faucets. Pair with the matching Estates collection mirror for added functionality and a polished, pulled-together look. The Provence 61 inch vanity combo is offered in a beautiful distressed white wood finish with hand carved French details. This vanity comes with all soft-close doors and drawer glides. Coordinating pieces include matching mirrors and linen tower to complete the look. The vanity combo includes an impala black granite top and dual undermount sinks. Designed with a traditional style and strong build, this vanity is a perfect choice for any bathroom. Its black granite counter and white solid wood base are very easy on the eyes. Put a nice twist on your bathroom project with this classic piece from Avanity. Estates 61-inch Vanity in Rich Mahogany with Granite Vanity Top in Black and 2 Sink Basins in White Make an elegant and warm statement in your master bathroom with the classic styling of the Pegasus Estates Vanity in Rich Mahogany with Granite Vanity Top in Black. 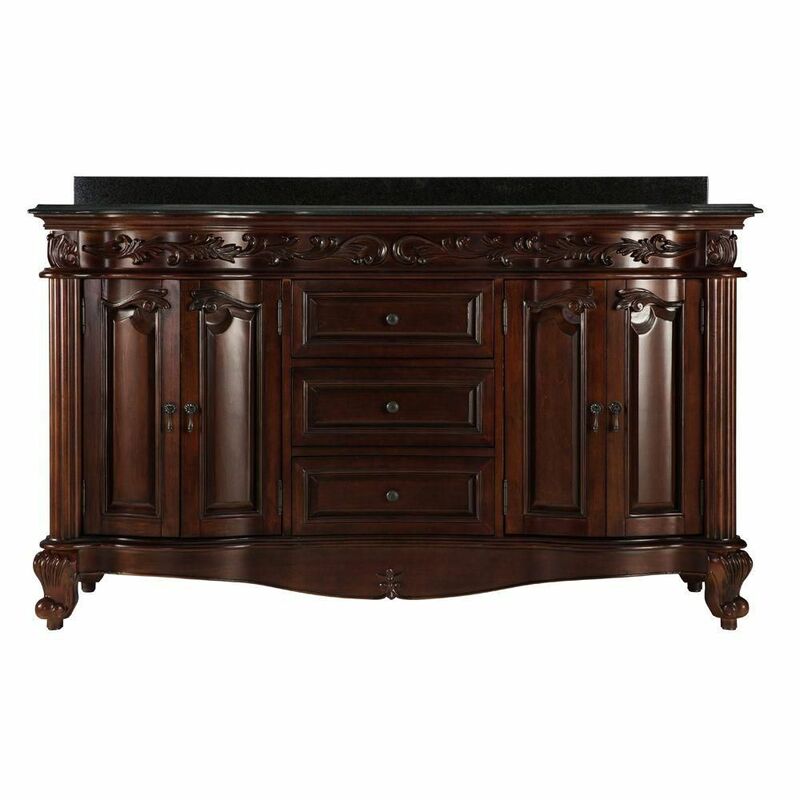 Beautifully detailed with hand-crafted scroll work and fluted pilasters, this vanity has a rich mahogany finish and provides ample storage with two spacious side cabinets and three centre drawers. The included black granite vanity top comes with two unattached vitreous china basins and a backsplash and is also pre-drilled for two 8-inch widespread faucets. Pair with the matching Estates collection mirror for added functionality and a polished, pulled-together look. Estates 61-inch Vanity in Rich Mahogany with Granite Vanity Top in Black and 2 Sink Basins in White is rated 4.8 out of 5 by 52. Rated 5 out of 5 by Lynsey from Amazing quality Came in good packaging no damage when it arrived quality is exactly what we were hoping for! We were very happy that you could remove the counter top because both pieces together are HEAVY! Rated 5 out of 5 by Mike54 from Great vanity, I've had it for almost a year and I love it. Looks great in my master bath. Great vanity, I've had it for almost a year and I love it. Looks great in my master bath. Rated 5 out of 5 by Anonymous from its great i recommend the vanity. great quality and looks very nice. its diy friendly on the installation. Rated 5 out of 5 by Anonymous from So rich looking Beautiful product !!!! Absolutely gorgeous .. This arrived to my house in perfect condition and looks amazing in my new bathroom .. I highly recommend this to anyone who wants a rich rich look without hitting your wallet to bad .. Rated 5 out of 5 by Iryna from great vanity for an excellent price We needed a "fancier" looking vanity for a ladiesroom in a nursing home and this one was by far the best by looks, quality and price. Sinks and top are included and if you buy everything separately it almost doubles the price. Don't hesitate. Is this 60&quot; vanity also available in the Antique White color as the other sizes are? Does this vanity come in a single sink model? Thank you for your interest in our Foremost products. Unfortunately, our Estates 60-inch W Vanity is only available as a two sink option.